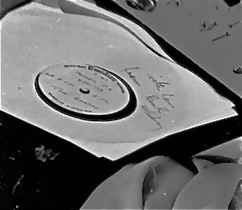 One of the most difficult items to identify in photographs of the Beatles with records are vinyl test pressings or acetates. These are cut at the studio and often contain demos or finished versions of songs or albums for them to listen to privately to gauge the quality of the pressing or the mix. At EMI in the 1960s these were pressed onto 45rpm singles or 331/3 LP’s using labels which looked like this: The labels were left blank for the producer or engineer to hand-write or type information about the track including the title, which take it was, duration, name of the artist, etc. 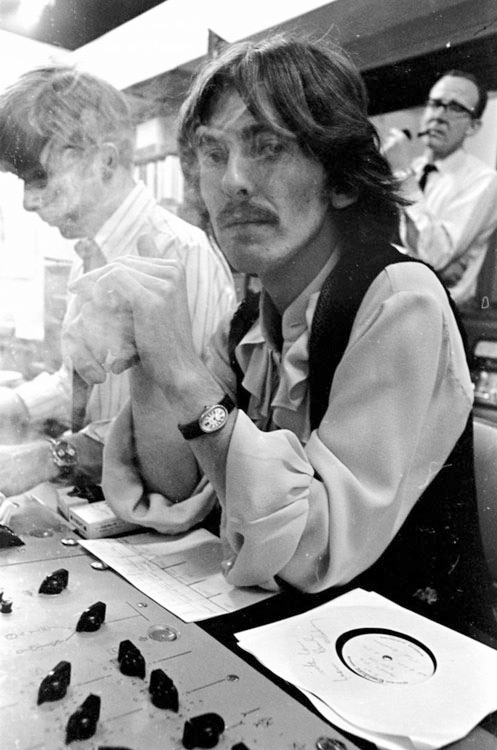 That brings us to this great picture of George Harrison, taken in the studio at about the time of the recording of the The Beatles (or The White Album) in 1968: First thing to say is that is a really cool watch he has on….. 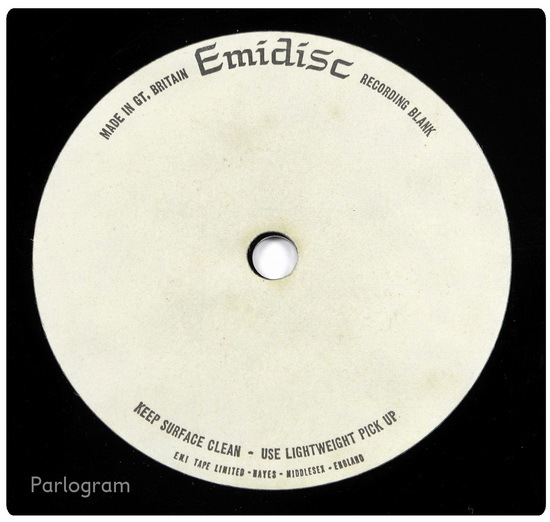 The tougher task is to identify what is hand-written onto the Emidisc label. We reckon it is this: under the word Emidisc there’s something like a number (maybe the duration of the track), then comes the song title. We think two words and, given this picture was taken during recordings for The White Album, our guess it’s the McCartney song “Honey Pie”. The writing looks a bit like that, too. Under that, just above the spindle hole, are some more letters or code numbers. On the left of the spindle hole it says “45 RPM”. On the right it looks like the duration of the track in minutes and seconds (which is difficult to make out). Then at the very bottom the writing clearly says “The Beatles”. Was this a test cut for George to take home and have a listen to “Honey Pie”? Any further insights, thoughts or suggestions are very welcome. 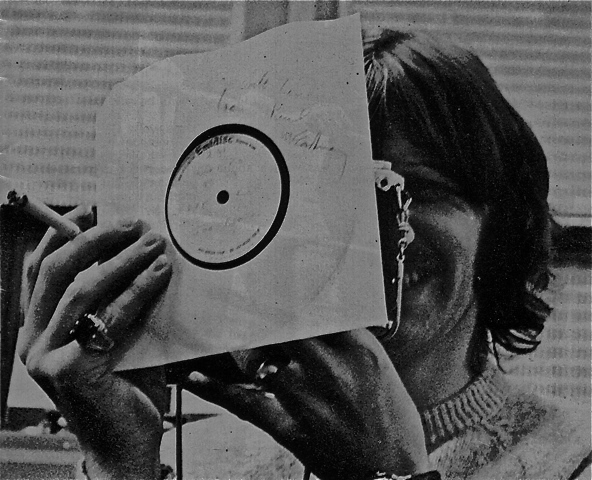 The person who posted this says it is Ringo holding an acetate recording of “Get Back” -which would place it in early 1969, not 1968. We’d prefer to go with this website that clearly places it as a photo session from September, 1968. It is pretty likely therefore that this is the exact same disc as the one seen with George. 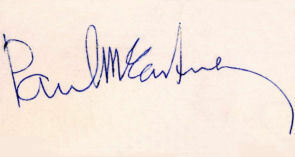 The plain paper sleeve has the same greeting written in the same position: “With love from Paul McCartney“. It is difficult to make out the writing on the label, but it has a very similar set-out to the previous one….again, thoughts and theories are welcome! This entry was posted in Beatles, Beatles Music, George Martin, Paul McCartney and tagged Beatles, George Harrison, Music, Paul McCartney, With Records by beatlesblogger. Bookmark the permalink. 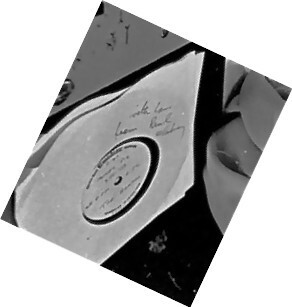 Why would Macca write that message on an in-house acetate? It only makes sense if it’s being given to someone else for some reason. Therefore, there’s a strong candidate for what the record is – McCartney would have recorded his contribution towards the year’s Christmas Flexi around November 1968, and he did so alone – without the rest of the group. And no doubt, it was taped at Abbey Road. He would likely have given a copy to someone involved with the mixing/production of the disc. That means a Macca acetate, with a message written on, which all makes sense. But what does the label actually say? I can almost convince myself it says “Something for the fan club” above the play hole, but in truth, it’s too blurry to make out. Anyway – that’s my theory! I recognize the engineer Ken Scott beside George (and behind the smoke …). I met him in may in the Abbey Road Studios where he gave a “lecture” in front of 80 fans coming from various countries. Thanks Claude. What a great experience – to be with Ken Scott at Abbey Road. Hope you are well! To be in the studio 2 is such an experience when I remember all the albums recorded inside. And Ken Scott has so many stories to tell, how he began, the first song (Your Mother Should Knew), the White album sessions and so on. I bought his book. I can can send you some pictures if you want.